Tomorrow, November 18th, I will be one of the artists who is making portraits of people at THE 2018 ® BIG DRAW FESTIVAL in Amsterdam, from 11AM until 13PM. 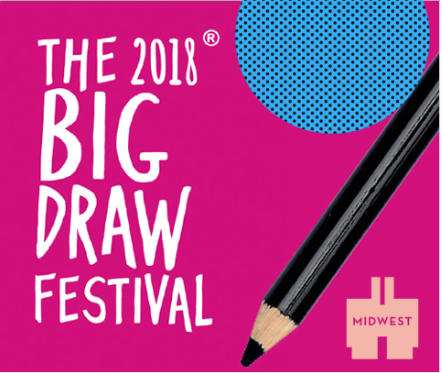 THE BIG DRAW is a world wide festival that was initiated in The United Kingdom. It’s the fourth version of this festival in the Amsterdam ‘De Baarsjes’ neighborhood and each time it has been organized by artists Judith Zwaan and Mariska Schomper. This year’s theme is ‘a local portrait gallery’. All portraits will be mounted on frames made from recycled materials. Photos of the event and the drawings I made will follow here a.s.a.p. Posted by mjaquet on 2018/11/17 in "group exhibition", drawing & painting, festival, live drawing / painting, painting, performance, portrait and tagged AmsterdamseMensen, De Baarsjes, live drawing / painting, maartje jaquet, people, PeopleOfAmsterdam, portraits, The Big Draw, the big draw in the baarsjes, WeAreOnePeople.